Informational Writing - Insects and Bugs Bundle of Flap Books! Have your children research dragonflies!. 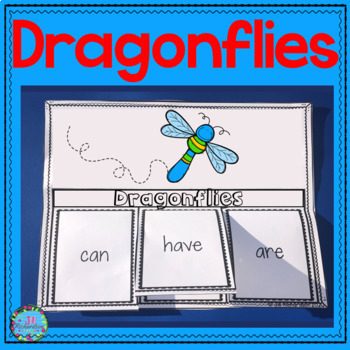 This product includes three ways for your children to share what they have learned about dragonflies in writing. Dragonflies: Tell about what they look like, Tell some interesting facts, Tell about what surprised you. Instruct children to cut out the top panel along the outside edge with the questions on the front. Cut flaps on the top sheet only. Children read instructions on the top of the flaps.. Open the flaps and write the answer. 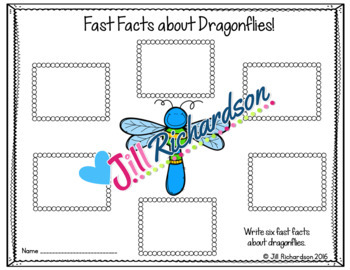 Write six fast facts about dragonflies on the fast facts printable. Pick facts that you found most interesting! Buy the Insects Bundle and Save 25%! Insects Interactive Writing Printables and Fast Facts Graphic Organizer Bundle! Insects Interactive Writing Printables Individual Product Links! Butterflies Interactive Writing Printables and Fast Facts! Ants Interactive Printables and Fast Facts! 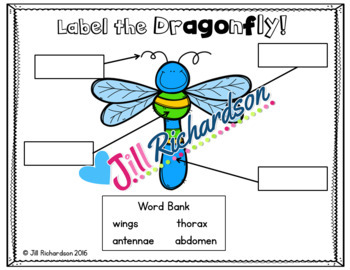 Dragonflies Interactive Printables and Fast Facts! Grasshoppers Interactive Printables and Fast Facts! Lightning Bugs Interactive Printables and Fast Facts! Bees Interactive Printables and Fast Facts! FREEBIE! Ladybugs Interactive Printables and Fast Facts! End of Year Awards! Bee Themed! ESL Newcomer Insects and Creatures!